Been a few questions about what color calves come out of different combinations how often. I'll explain it how I understand it. If anyone knows something I don't about different combos or breeds or thinks of something I don't please chime in. Each cow or bull has 2 genes for basic color. Black is dominant over red. So for basic red and black cattle you can have - a red animal with 2 red genes, a black animal with one red and one black or a black with 2 black genes. Breed a red to a double black offspring will be black every time. Breed a red to a black carrying a red recessive gene and you'll get half black half red. Breed 2 blacks both with a recessive red gene and you'll get a red a quarter of the time. I'll do Charolais when I get a minute, chores are calling! Shorthorn and Longhorn don’t play by the rules either. The interesting thing about color in cattle is that just because they look like one thing phenotypes wise doesn't mean that is what they are genetically. You just don't always know what is in the woodpile. Also-lots of people don't know the characteristics of many breeds and they buy/sell cattle calling it the wrong breed. Charolais - the white works to dilute colour and takes 2 of the gene to make a white animal. Tans are one white one red gene, silver or grey one black one white. If you breed a charolais to a black animal carrying the red gene it's a 50/50 shot of getting a tan or silver/grey. White to red and you will get all tans. Breed a tan to a white and you should get half tan half white. Tan to tan and 1/4 red, 1/4 white, 1/2 tan. This cow is half Hereford half Charbray breed to an Angus bull. This cow is Charbray bred to the same bull. Last years calf same bull. It’s kinda like M&M’s when Charolais is added to the woodpile, you just don’t know what color is coming out of the bag. This is a cool thread. My grandpa had a two tan baldies when I was growing up. Always thought that was a neat look. It's fairly predictable on it's own but I absolutely agree when you start getting to the 2nd generation removed with 3-4 breeds involved becomes a guessing game. Especially when you don't know the full lineage of all involved. Those recessive genes seem to come out of nowhere. I breed primarily black cows to Charolais and get about half tan half silver. 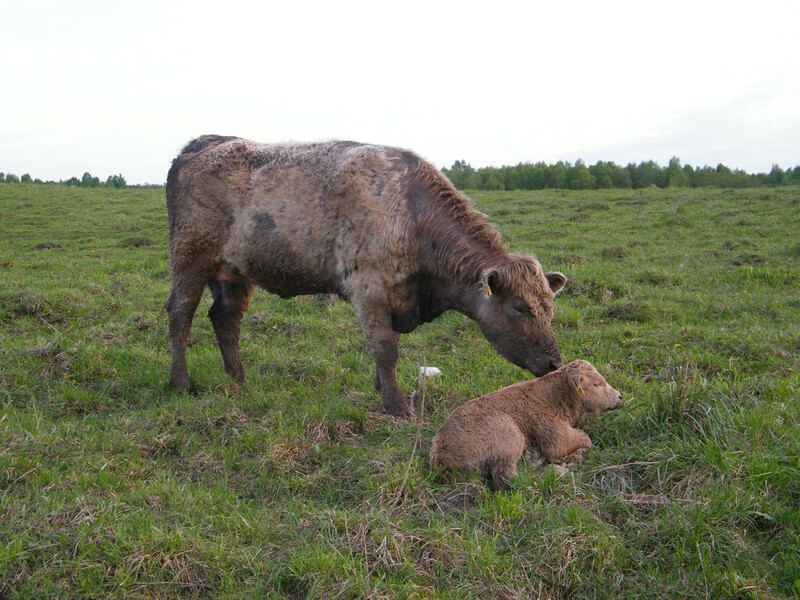 The calves also often inherit the longer hair from the Char. 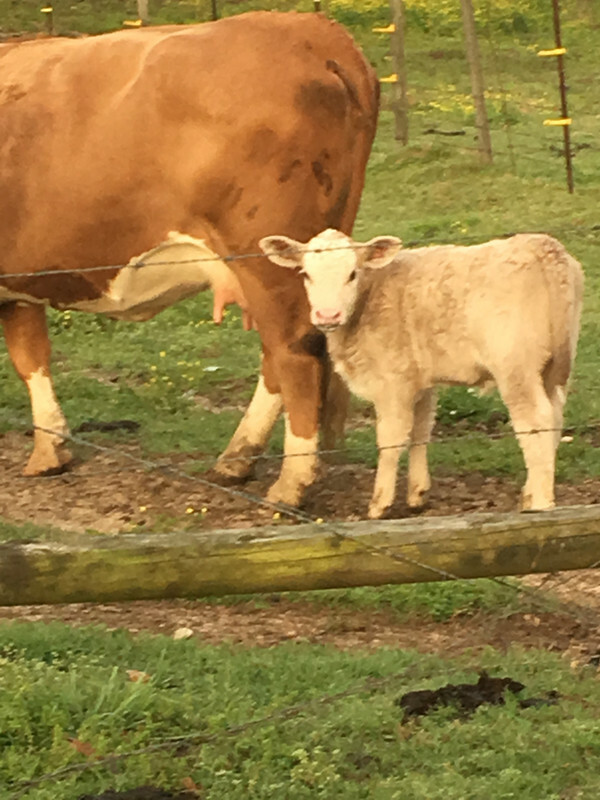 I had a group with some white cows and a Black angus bull last year and thought I'd get the same but the calves were darker grey with shorter hair. Used to be a nice, in-depth treatise on the subject at a braunvieh.com site that's no longer in existence. Used several 'yellow & white' Simmental sires back in the 1980s, and bought in one little yellow lineback cow(presumably a Charolais cross of some sort), back in 86... Simmental color dilution gene and the Charolais color inhibitor genes are hard to breed out... still getting colors ranging from white to silver to gray to charcoal to brown to mousy gray - whether sired by black or red bulls - out of those diluted brown/gray cows... though the two 'white' cows typically throw either a white/silver calf or an undiluted red or black, depending upon what they're bred to. A bit of Charolais sure can make things interesting! This girl is 50% black Angus, 18.75% Charolais, abit over 9% Limousine and 6%BB. She was born as a very light tan colour and in a couple months turned grey. That was her first calf from a red limousine bull- black heifer. 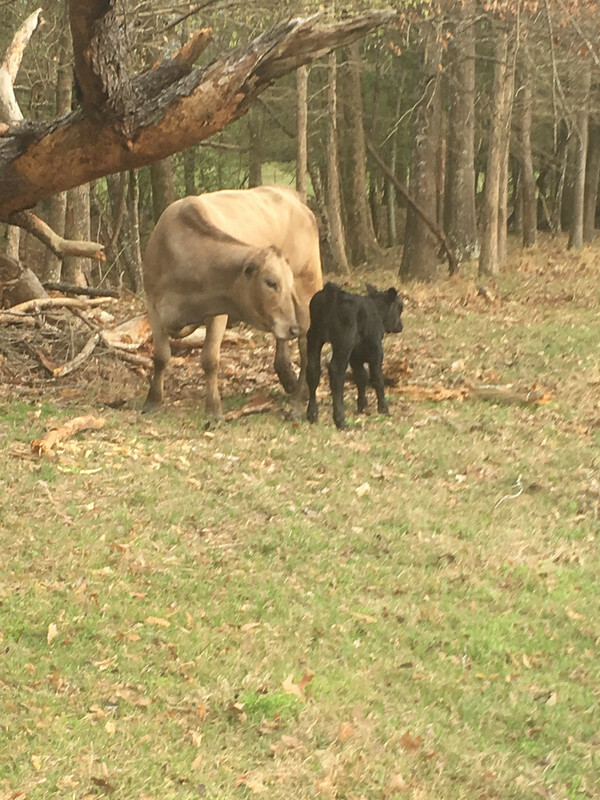 Her 2nd calf from the same limousine bull was a tan bull calf. Now she's in calf with Charolais and it'd be a huge surprise if the calf wasn't white. Have another cow, which is 50%Angus, 18.75% Char. 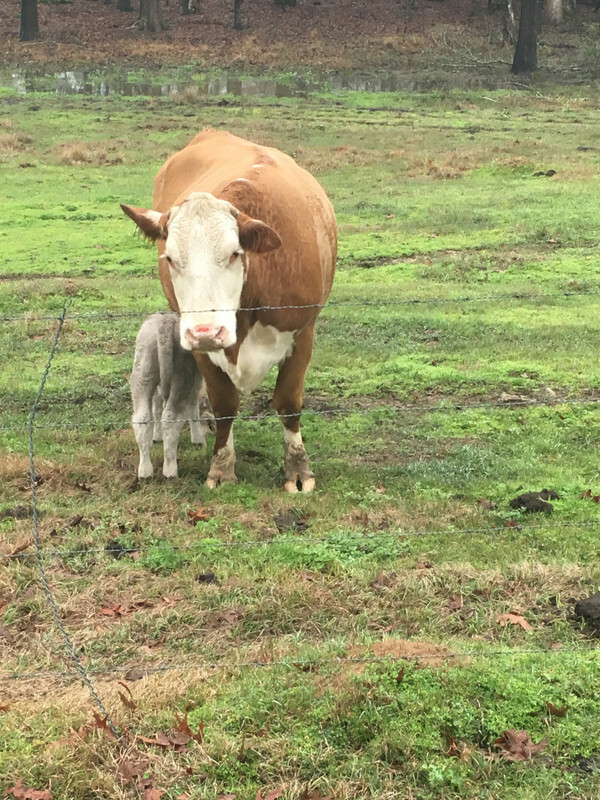 Her first calf from a limousine was white, second was black and the third was tan. Waiting for another limox calf from her. Wonder what colour will be this time. One more cow: 25%Angus, 37.5% Charolais, 18.75% Limo. The calf is already 2nd calver and both calves from limousine were red. 79.7% red limousine... If only it was a heifer, I'd have been very tempted to use limousine again to see how many generations it would take to change the colour. I do not care for the reality, but black = money in the USA. Whatever you do, get the influence or take a hit. Quite a shame. Yellow baldie will be a few pennies behind on price. On weight with the same birthday 40 to 50 pounds ahead. Price per pound doesn’t always skin the most frogs. That's why I switched to Char bulls for my blacks. Figured more lbs/hd would make it at least even out. The EPD crossbreed chart puts Char at +38lbs(above Angus) for WW, my +52lb WW Char is effectively a +90lb angus bull and hybrid vigor is kicking my calves in the azz to grow too. Reality has been better than theory in my case. The market report range for the weight class may be topped by a group of blacks but the vast majority of all calves in that range are black. Buyers can be more selective. I've found my calves get purchased consistently closer to the top in a narrower range and they're also heavier. No I'm not in the US but the same packers are buying them. If only it was a heifer, I'd have been very tempted to use limousine again to see how many generations it would take to change the colour. It's hard to follow using percentages, easier to think in terms of each parent having 2 genes, figuring out what they are and predicting results. I think the calf in the first scenario should be white or silver which will look white with dark points if the Charolais bull is white. It could take a long time to breed the color out, basically forever if you select heifers that are expressing the dominant white diluter gene. But if you have a heifer that has the red limo gene, it's gone. 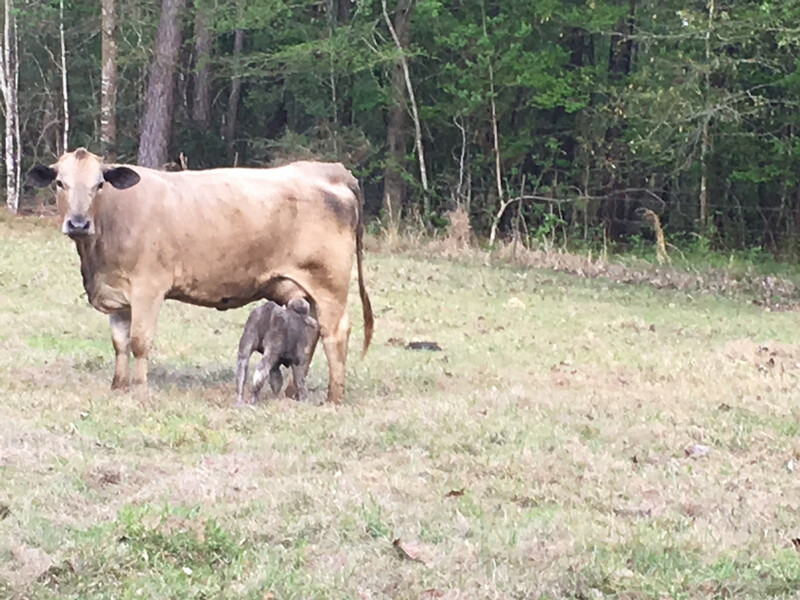 Put a little Brahman in with the English and Continental and hybrid vigor is off the chart. This is what I like grow like a rabbits this calf is 3 weeks.